Another late post, my apologies. Last Sunday had incredible weather…the kind that you read about in old books about New England. 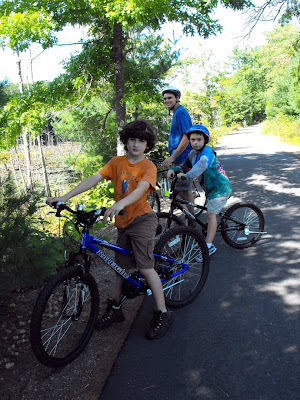 On the spur of the moment, we got a few folks together for a quick trip on the Windham Rail Trail…we were NOT alone. Odd some days I get out there and it seems that everyone called ahead and arranged the day. From my experience it seems Monday holiday mornings are FAMILY days, and it seems Sunday mornings are DOG day, or rather BIG DOG day. It seems a new trick is for walkers to bag their Dogs leavings and then leave the bag on the side of the trail for the return trip…as practical as this is. I and the other trails users found this habit slovenly and rude. If you are reading this…knock it off. 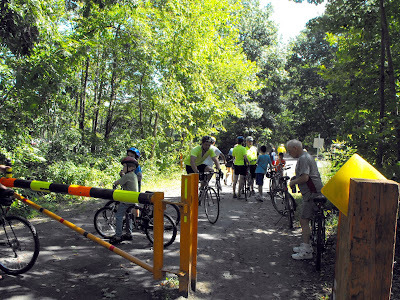 If you want to ride for long stretches pretending you are alone on the trail, weekday mornings are ideal. Basically all day week days until about dinner time you can be alone for most of your ride, but the more I ride the busy times, the more i LIKE the happy communal atmosphere that a busy trail gives off. Everyone is smiling, everyone nods as you go past. Dog people talk to dog people, children people try to rein in their kids as they go tearing up ahead unmonitored, it has a very town and country feel to it. We are hoping that if we keep doing group rides at the drop of a hat, we will eventually build up a base of interested riders to have ‘Official’ group rides.